The following is a sponsored post on behalf of Moore’s Marinades & Sauces. All opinions are my own. Good morning, friends! Happy Friday! I am so excited to be partnering with Moore’s Marinades & Sauces to bring you a DELICIOUS recipe that we make ALL the time! Moore’s Marinades is a local brand that I have used and loved for years. It is the key ingredient to Uncle Bee’s Best Burgers. We just love the hickory smoke flavor it adds to meat. Moore’s Marinades and Sauces began over 30 years ago at a family-owned steakhouse in the small town of Jasper, Alabama and quickly became a staple throughout the South for it’s delightful hickory taste. And if I can keep myself from stealing bites every time I open the fridge, I may even have some leftover to freeze…. but it’s not looking likely 😉 I love this recipe because not only is it delicious & easy, it makes your home smell as amazing as your favorite barbecue joint and I usually have all of these ingredients on hand! It is important to note that this already smells good before I even plug the slow cooker in. Place pork in crock pot and add chopped onions and garlic. Combine Moore's, ketchup, apple cider vinegar, tomato paste and brown sugar. Pour over roast and cook on low for 8 - 10 hours or until pork is fall apart tender. Remove pork and shred with 2 forks. Allow crock pot juices to cool completely and skim off the fat. 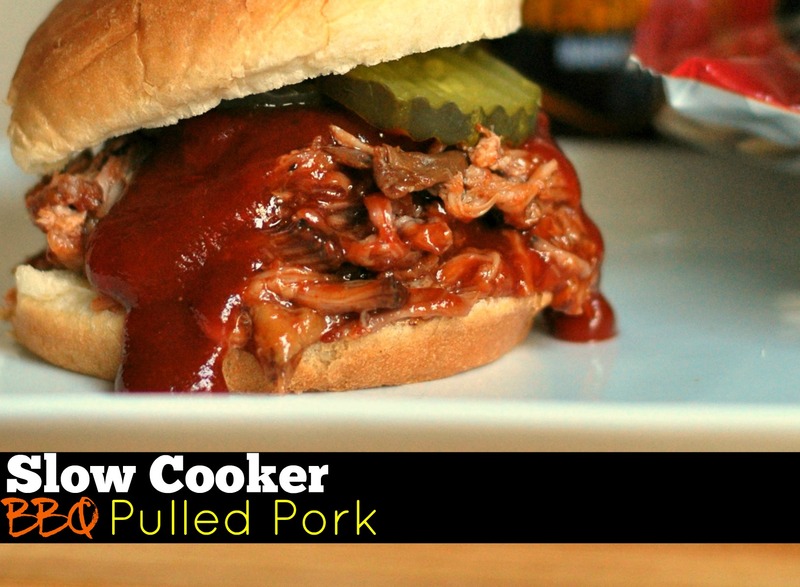 Add some of the remaining juices to your favorite BBQ sauce and toss with the pork. Enjoy! 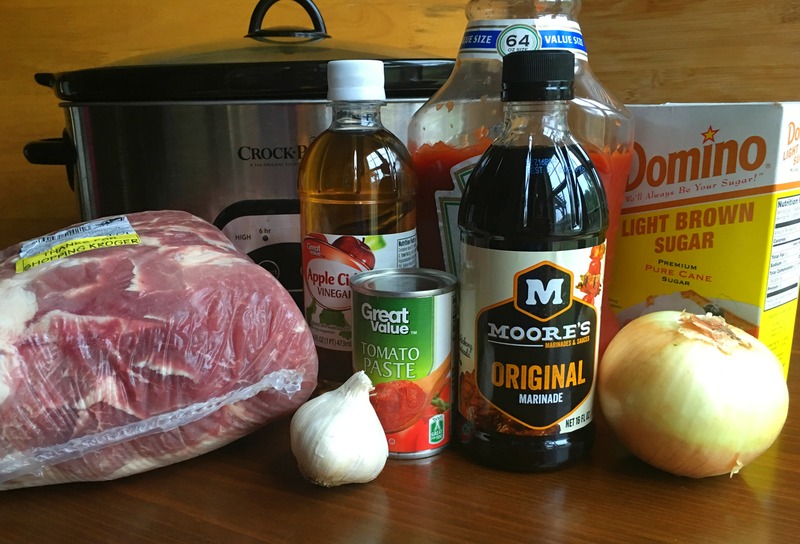 ***Update*** I have gotten so many emails from people telling me that they can’t find Moore’s Marinade in their area and asking what they can substitute because they really want to try this recipe. If you absolutely must, you can substitute Dales Marinade and a Tablespoon of hickory liquid smoke. This was a sponsored conversation on behalf of Moore’s Marinades and Sauces. All opinions are my own. I’m going to have to try this ASAP!! Looks so yummy and easy! What a GREAT recipe!! 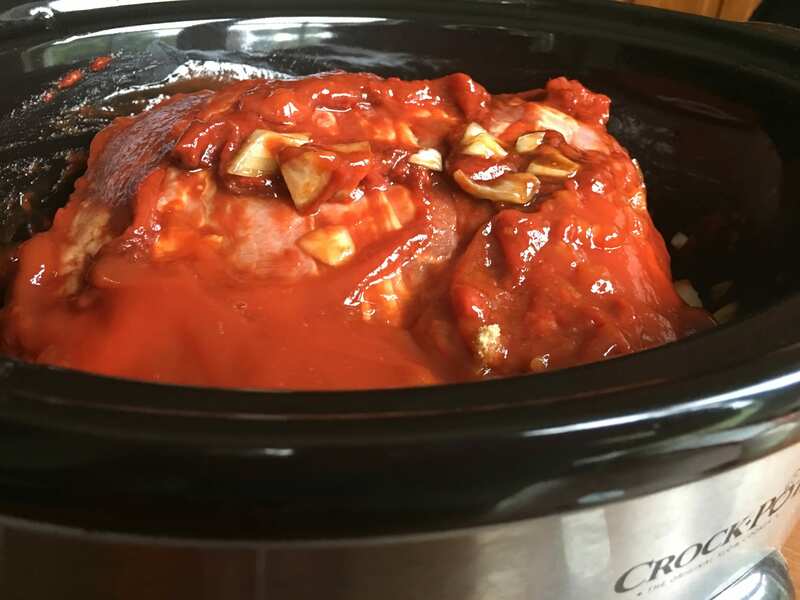 I love using my crock pot – especially in the summer when it’s so hot I don’t want to use my oven. Thanks for sharing with us!